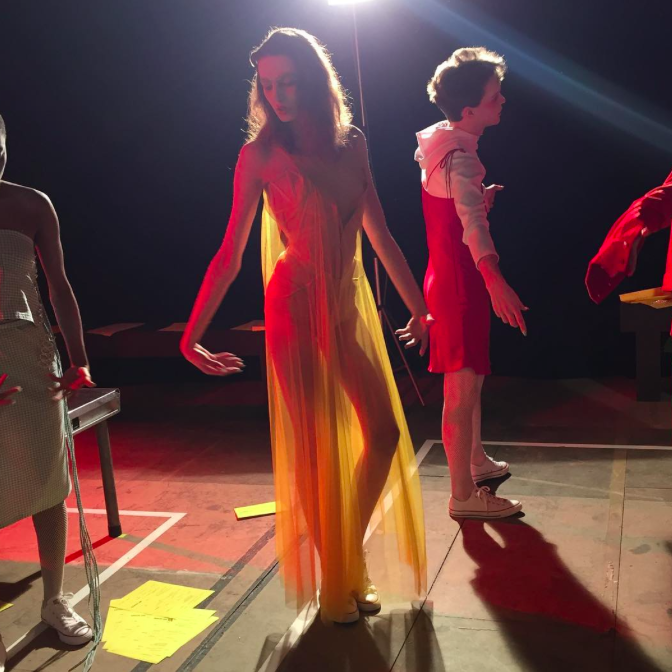 ART SCHOOL’s debut collection with Fashion East was shared as a performative presentation in collaboration with Theo Adams Company. Inspired by influential art collectives such as Diaghilev’s Ballet Russes and The Bauhaus, this collection very much captured the spirit of creativity and fearlessness which binds artists together. The overarching theme was the representation of non-binary identity and queer style, so the designers reimagined key pieces from their own wardrobes, as well as those of their friends, to convey this idea. Outerwear was boxy and androgynous and bottoms had a retro vibe, featuring either flares or box pleats. Dresses were seen on both male and female models, either as slips or as more structured pieces. Styling was also interesting, with make up straying more towards artistic than fashion-orientated and every model was seen sporting the same pair of white converse. The colour scheme was a mix of pastels and brights, which referenced Derek Jarman’s work Chroma and a partnership with Swarovski also saw pieces embellished with luxurious crystals. All in all, this was a promising start for ART SCHOOL and I’m sure we’re all looking forward to seeing which societal ideas they’re going to challenge next.